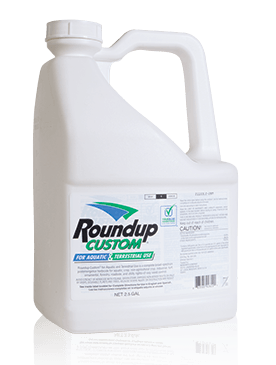 Roundup Custom Herbicide for anywhere weeds and water meet, there’s a strong chance that vegetation management problems will grow. Roundup Custom herbicide gives applicators maximum use flexibility for both aquatic and terrestrial jobs. Roundup Custom Herbicide for anywhere weeds and water meet, there’s a strong chance that vegetation management problems will grow. And anyone who manages brush in wetland areas knows that when left unchecked, vegetation can create hard-to-resolve problems. Roundup Custom herbicide gives applicators maximum use flexibility for both aquatic and terrestrial jobs. We recommend the use of a spray adjuvant that helps break down waxy cuticle on leaf surfaces like Cide-Kick II with this product. Excellent fit for all aquatic, forestry, right-of-way, industrial, turf, ornamental and habitat-restoration use sites, especially where weeds and water meet.